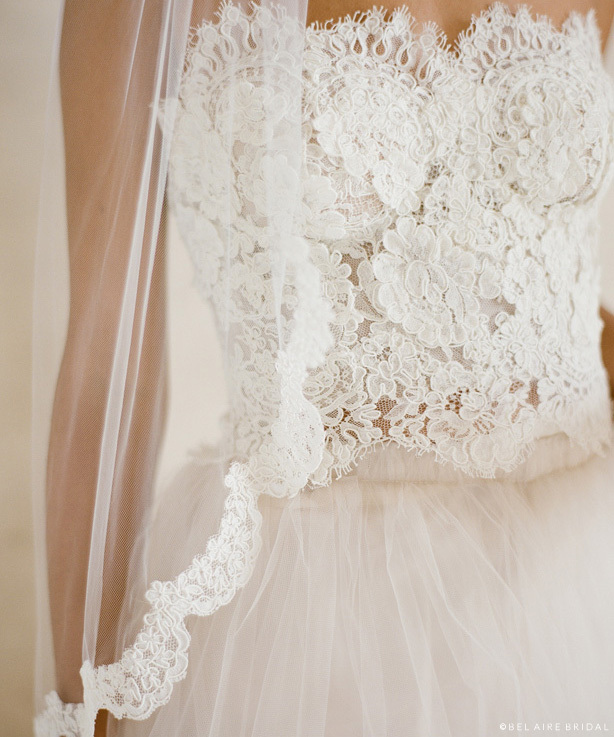 There’s nothing like a veil to make you feel like a bride. The timeless beauty of lace adds an air of feminine class to your wedding day style. Elegant and intricate, a pretty lace veil completes your look with sheer romance. If you’ve got your heart set on a stunning lace gown, you might want to check out one of our most coveted lace veil styles: V7162. Style V7162 is a single tier, scalloped lace edge veil that floats to your fingertips. This gorgeous style is available in blush, champagne, diamond white, ivory, or white tulle. Enchanting Alençon lace beautifully enhances floral lace gowns, as well as dresses with dimensional flowers. For an extra-dreamy ensemble, you can even pair this design with a soft tulle skirt. This lovely piece pairs well with romantic hair flowers, gold accessories, and feminine belts. Try it on at your nearest bridal salon! You can also check out our newest headpiece collection to add a lovely bit of hair jewelry; be sure to stop by our belts page for a pretty bridal sash to complete your look. You only get married once. Create a once-in-a-lifetime ensemble for your special day!